Our July-August double issue of Intercom is out now! 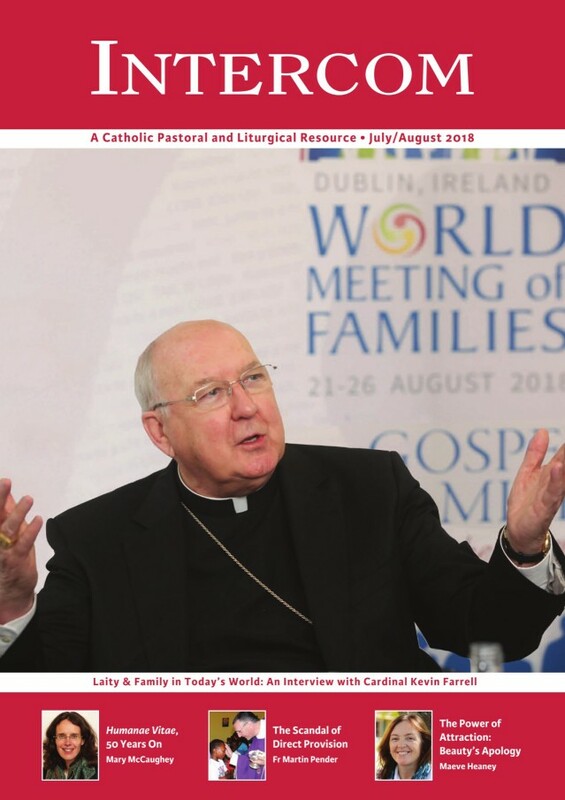 In this month’s issue we feature an exclusive interview with Cardinal Kevin Farrell, prefect of the Vatican Dicastery for Laity, Family and Life, as we look ahead to the World Meeting of Families! In our new issue we also hear from Fr Frankie Murray, Parish Priest of Drumshanbo, who reflects on the World Meeting of Families while on pilgrimage in Lourdes and Father Tom Dalton offers his thoughts on ministering to tourists during the summer. We also welcome back former Intercom editor Fr Paul Clayton-Lea who introduces his new Veritas book In the Light of the Word: Family Life through the Lens of Scripture, and John Quinn of Grace Communications on the new YourParish App. All this and more, along with all our regular resources, prayers and reflections for July and August. Click here to see the full contents page from our July-August issue. Our June Newsletter, Irish Mass and Prayer Resources are available here. July-August resources will be available shortly.